Saint Achillios Church, (Serbian Cyrillic: Црква светог Ахилија) is a church in Arilje, Serbia. It is dedicated to Saint Achillios from Larissa (Greece), fighter against Arianism and participant of the First Council of Nicaea in 325. Saint Achillios Church was built in 1296, and is closely connected with the Nemanjic dynasty, the first Serbian archbishop St Sava and the misfortunate King Dragutin. With its surreal whiteness and slimness it continues to dominate the core of the west-Serbian town of Arilje as a lighthouse of Christ's faith. In close proximity to St Achillios Church there is the Raspberry Monument that declares the outstandingly convenient soil for growing raspberry, from which the inhabitants of the entire region live very well. In terms of its architecture St Achillios Church belongs to the Raska School which marked the 13th century with the coherent mixture of Romanesque outside dressing and Byzantine space concept. Facade painting of the St Achillios Church in the Byzantine cell type style, the technique which included alternating rows of stone and brick, on the walls dressed in Romanesque style makes the Church of St Achillios a unique 13th century structure in the whole Byzantine world, considering the fact that there is no preserved example of any Orthodox place of worship dating from that period with the facade entirely decorated in this way. 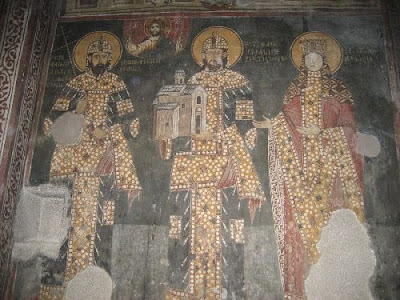 Besides its architectural value and historical significance the St Achillios Church also stands out as the gallery of valuable frescoes among which the most interesting are the portraits of the rulers belonging to the Nemanjic dynasty, their relatives and all the archbishops since 1219 - the foundation of the independent Serbian Church. The most attractive are the portraits on the south part of the internal narthex, the standing figures of king Dragutin the founder holding the model of the church in his hands, and the fresco above the holy grave of Dragutin's younger son Urosic, who died young as monk Simon and was buried in the Church. Being the clear document of the king's sponsorship and an illustration of the mutual respect (brothers lived peacefully in the time of fresco-painting the church), one of the most beautiful idealized portraits is the portrait of the ruling brothers Milutin and Dragutin Nemanjic accompanied by Dragutin's wife, Hungarian Princess Katelina. For the first time in the history of Serbian fresco painting a new iconographic solution appears. By that time it was usual that the Mother of God or the saint protector approaches Christ on the throne with the founder holding the model of the temple in his hands and with his head bowed. But here in the medallion there is a reduced painting of the Lord standing in the middle of the two kings Dragutin and Milutin who are frontally turned and blessing them with his raised hands. The representations of these characters occupy a special place in the development of the Serbian medieval portraiture. The fresco of the Archangel Gabriel, called the Blue Angel, which represents the elegant holy character in brilliant simple vestment, is the incarnation of the idea of the Lord's representative of surreal beauty and magnificent kindness. The figure of the archangel with his clearly expressed character, strong musculature and rich robe of a warrior is of extraordinary artistic value. It is one of the masterpieces of old Serbian painting. The portraits of Dragutin's sons Vladislav and Urosic bear high historical significance and the depictions of Serbian archbishops, members of the Nemanjic dynasty and the portraits of Moravica bishops and metropolitans make one of the most important compositions of wall paintings in which important persons of Serbian history can be recognized. The names of the authors of the frescoes in Arilje Church are unknown, but we do know that they come from Thessaloniki. In terms of both their style and iconography, the frescoes from Arilje in St Achillios Church announce the turning point in the development of wall painting and a new style which will mark the art of painting during the first decades of 14th century Serbia in King Milutin's court. Dragutin's younger son, prince Urosic is buried in the temple of Arilje. This fact points to the importance of the temple for the king himself and possibility that one of the courts was located near Arilje. The thing that undoubtedly distinguishes this temple from all the other Nemanjic dynasty memorials dating from this period, besides its height and lack of bell tower above the external narthex which is the feature of all bishopric centers, is the entrance on south side instead of the usual west. 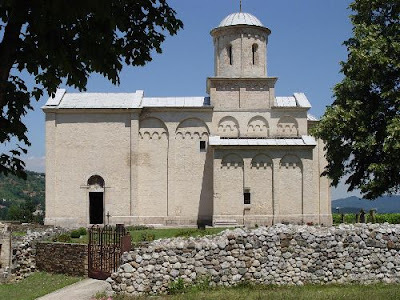 Unlike other churches built by the Nemanjic's in the 12th and the 13th century which were not cathedral temples for large number of believers, the church in Arilje had exactly that purpose and it was built on a hill top so that it could be easily visible. During the reign of Tzar Dusan and after the Serbian Patriarchate in 1346 was proclaimed, the Moravica Bishopric was promoted into a Metropolitan's residence. Arilje Metropolitan's residence and monastery fraternity shared the same fate with their people and state in the horrible attack of the Turks led by Mehmed II the Conqueror of Constantinople. The Moravica Metropolitan's residence revived again during the forties of the 17th century. Not until 1833 will the church bells be heard again. But this time not from the Metropolitan's residence but from the parish church only. The St Achillios position and its appearance even today cause in the spectator the feeling of awe, thrill and uniqueness. 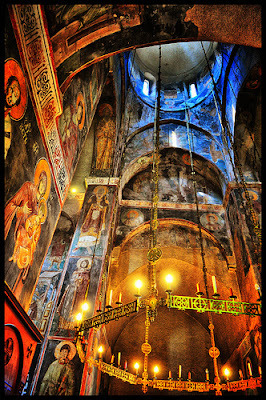 The Church of St Achillios is a pronounced cultural monument of great significance.